Archive study shows that formal inclusion of women does not automatically lead to their full participation, say Aileen Fyfe and Camilla Mørk Røstvik. Aileen Fyfe is a professor of history at the University of St Andrews in Fife, UK. Camilla Mørk Røstvik is a Leverhulme Early Career fellow at the University of St Andrews in Fife, UK. In 1665, the first issue of the world’s longest-running scientific journal appeared: Philosophical Transactions. It was not until 1787 that astronomer Caroline Herschel became the first woman to publish a paper in it1. From its beginnings, the journal was tightly linked with the gentlemanly culture of the Royal Society in London2. By the 1940s, about 4% of all papers submitted to the Royal Society’s journals had a female scientist as an author or co-author3. Yet editorial responsibilities were restricted to scientists who were fellows of the society. 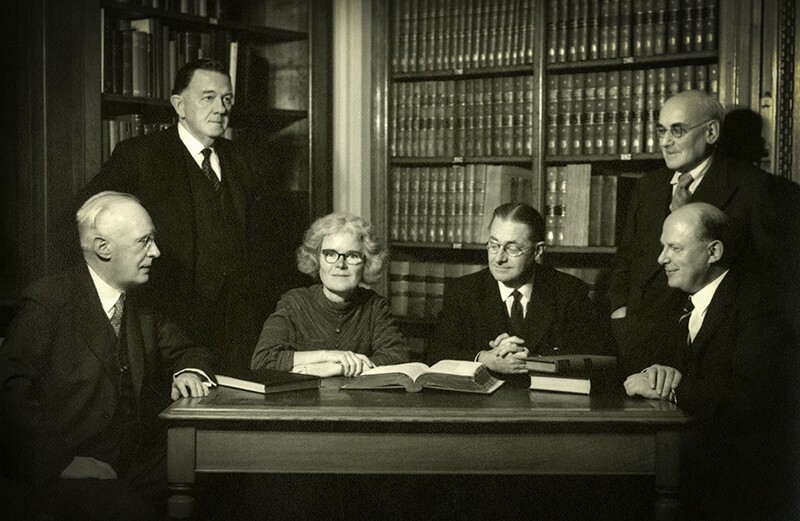 So women’s involvement in editorial and reviewing roles at the society did not begin until 1945, when the first women were elected as fellows: crystallographer Kathleen Lonsdale and biochemist Marjory Stephenson4 (see ‘Women at the Royal Society’). By 1955, numbers had increased to 10 women — compared with 556 men5,6. Tempting as it is to point to the ‘first woman’ as a key moment in institutional histories, it is surprisingly difficult to see 1945 as marking a significant change in the running of the Royal Society or its publications. This is our conclusion after sifting through decades of archival records, including referee reports, personal correspondence between society officers and referees, and ledgers used to track submitted manuscripts. Numbers of female fellows of the society did increase over the late twentieth century (see ‘Few female fellows’). But the extent of women’s authorship and editorial work did not follow suit. In fact, in 1955, 2.8% of submitted papers were refereed by a woman; in 1985, only 0.3% were. Modern sociologists who study gender bias in scholarly publication usually focus on the experiences of authors, because the confidentiality of traditional peer review masks the identity of referees and editors7. The advent of open peer review enabled a 2017 study8 to show that women are under-represented as reviewers, and that editors tend to select reviewers of the same gender as themselves. Our study of the Royal Society’s editorial processes adds depth to this discussion. The numbers are tiny, but we know the identities of referees and committee members and can examine their work over several decades. The first hurdle to having a manuscript accepted in a Royal Society journal was not actually the referee process. Only fellows could officially ‘communicate’ papers, so would-be authors had to persuade a fellow to act on their behalf. About 80% of papers submitted in the 1950s were from researchers who were not fellows. The gate-keeping system ensured that almost all female scientists submitting to the Royal Society had to do so through a male intermediary. Of the handful of female fellows who could have acted as communicators, Lonsdale was the most active. Yet she rarely introduced more than one paper a year. And the society archive contains no evidence of her intentionally promoting female-authored manuscripts, although she is known to have invested in the career success of female PhD students9. The fellows who communicated the most papers ran research laboratories, so had a stream of junior scholars working with them. For example, crystallographer Lawrence Bragg, chemist Eric Rideal and physicist Nevill Mott each typically communicated around four or five papers a year in the 1950s. Female lab heads were still relatively rare even several decades later. Key moments for female participation in the world’s oldest scientific academy. 1665: First issue of Philosophical Transactions is published. 1787: First report in Philosophical Transactions by a woman: astronomer Caroline Herschel’s description of a comet. 1826: Astronomer Mary Somerville publishes in Philosophical Transactions. 1902: Royal Society declines physicist Hertha Ayrton’s nomination for fellowship because she is a married woman. 1939: Botanist Agnes Arber asked to referee a manuscript, a rare request to a non-fellow. 1945: Crystallographer Kathleen Lonsdale and biochemist Marjory Stephenson elected as the first female fellows. 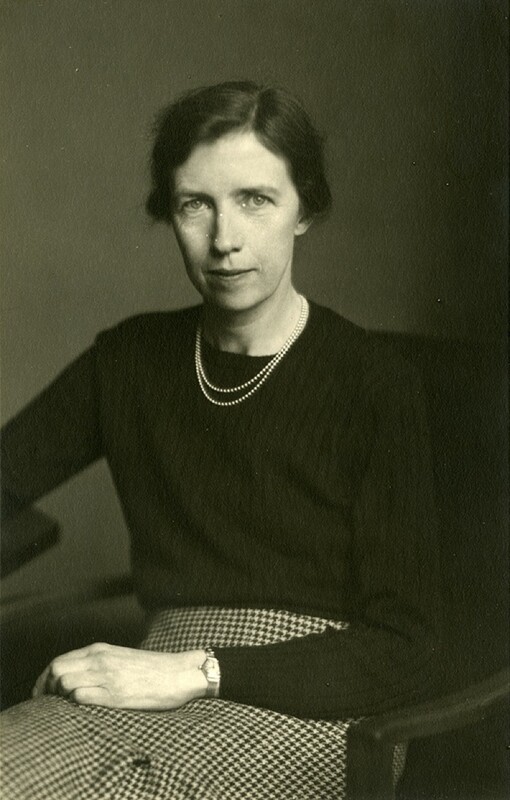 1950: Mary Cartwright serves on the editorial committee for mathematics. 1969: Referees for Royal Society journals need no longer be fellows. 1990: Authors allowed to choose how their names are published. 2008: Ecologist Georgina Mace is the society’s first female journal editor. 2016: 26% of members of publishing committees identify as female. 2017: Computer scientist Wendy Hall becomes the first woman to chair the publishing board. Refereeing seems to be a role that could have been more open to female fellows. Again, at the Royal Society, Lonsdale was by far the most active. She wrote 8 of the 10 reports penned by female referees in 1955, and 10 of the 12 in 1956, a level of productivity that made her part of an elite group of active fellows. The majority did little or no refereeing, men and women alike. By the mid-twentieth century, few scientists (or fellows of the Royal Society) were wealthy gentlemen. But gentlemanly codes of conduct still prevailed in academia. Social practices, such as engaging in reasoned discussion at meetings or offering constructive criticism in referees’ reports, enabled scholars of different social and intellectual backgrounds to get along (most of the time). In 1923, the Royal Society Club — a private dining group whose members were all fellows — extended a dinner invitation to that year’s prize lecturer before realizing that metallurgist and crystallographer C. F. Elam was a woman. She tactfully declined, and accepted “a very beautiful box of chocolates” instead. When crystallographer Dorothy Hodgkin (already a fellow of the society and a Nobel laureate in chemistry) was the prize lecturer in 1972, the club felt “obliged to invite her”, according to her contemporary, the physicist Thomas Allibone, even though dinners were normally held in the men-only Athenaeum Club. ‘Chivalry’ towards female scientists also meant gendered use of titles. In 1960, for instance, an influential fellow wrote a covering note for a paper submitted by crystallographer Helen Scouloudi, describing her as “Miss Scouloudi”. He praised her work, but still noted her gender at the expense of her doctorate. The same thing happened in the society’s internal editorial records and published articles. Male authors’ names were reduced to initials (unless they were knights). Women who were sole authors had their first names spelled out, and those who were co-authors were identified by ‘Miss’ (or ‘Mrs’) in front of their initials, even if they held PhDs. This means that referees always knew the gender of authors they were reviewing. This level of care did not extend to women as referees. Standard letters and forms used by referees addressed women such as Lonsdale as ‘Dear Sir’ until the mid-1960s. At the same time as feminist writer Betty Friedan was describing sexism as “a problem without a name”, women’s names and titles were being casually neglected at the Royal Society. It is hard to say whether referees’ awareness of authors’ gender affected evaluations: few papers authored by women arrived at the society. In the 1980s, the male referee of an article on chick embryology by two female authors criticized the paper’s tone as “too enthusiastic”. Another male referee objected that a paper by established palaeontologist Pamela Robinson, which called for evidence of temperature rises and glacial melting to be incorporated into a new approach to palaeoclimatology, was “too ambitious” and used “emotional expressions”. (His examples included the phrases “monotonous climate” and “beautiful autumnal colours”.) Our sample is limited, but the only instances in which we observed such complaints were about papers authored by women. By the 1980s, there was a higher proportion of women in the Royal Society than ever before. Yet authors submitting to the society’s journals were less likely to have their work considered by women referees. In fact, there are many years for which no woman is listed as a referee at all. This is despite the fact that editorial guidelines were relaxed in 1969 to allow non-fellows to act as referees. Unfortunately, we do not have any information on the number of female scientists who might have been asked to referee, but declined. Women had taken on other, more visible roles. 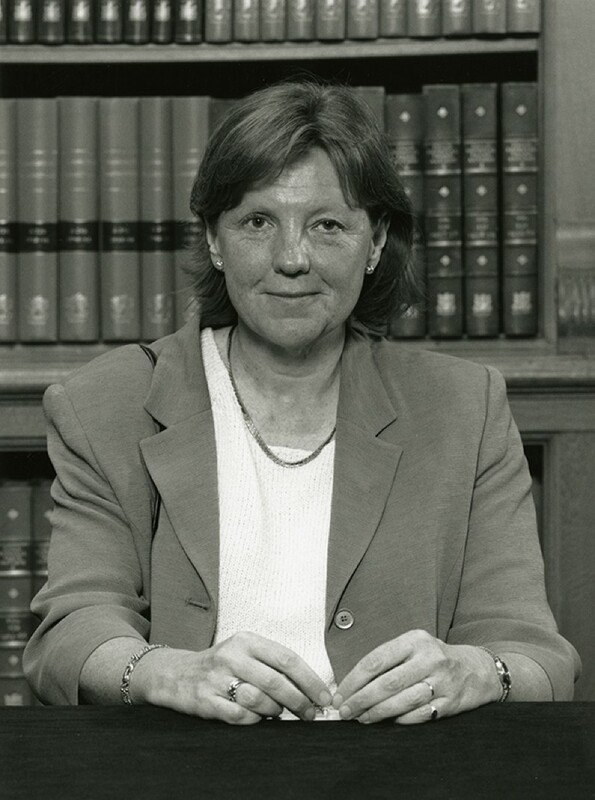 Biochemist Patricia Clarke and immunologist Brigitte Askonas both served on the council, and developmental biologist Anne McLaren became the society’s first elected female officer (as foreign secretary), in 1991. Also, many women elected to the society in the 1980s were already in or near retirement and might have participated less than their younger peers. Much changed at the Royal Society around 1990, including the abolition of the need for authors to find a ‘communicator’, and the discriminatory naming conventions. The society’s editorial records also moved from physical ledgers to an early computer system, the obsolescence of which has so far prevented us from extending our study into the 1990s. Two of the society’s journals have now had female editors (ecologist Georgina Mace and geneticist Linda Partridge at Philosophical Transactions B, and science historian Anna Marie Roos at Notes and Records of the Royal Society). And 26% of members of publishing committees identified as female in 201611. We do not have data on women’s participation in refereeing since 1990. 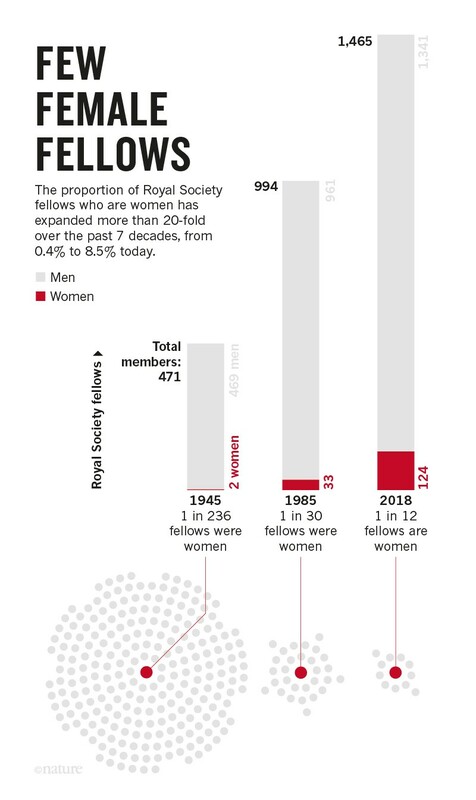 By February 2018, the number of female fellows of the Royal Society was only 124, or 8.5%. For comparison, 24% of professors in the United Kingdom were female in 2017. Ratios this skewed mean that each elite female scientist faces greater pressure to shoulder more responsibilities — plenaries, panels, mentoring and so on — than her male peers. A male fellow reflected on this in an interview in 2017. Delighted that a woman was about to chair the society's publishing committee, he told us: “It’s generally easier to twist a bloke’s arm than to twist a woman’s. I’m always reluctant to twist a woman’s arm … It’s hard enough being a woman in science most of the time, without taking on all sorts of pro-bono jobs.” For us, this illustrates how lingering chivalry may limit women’s participation. We began our research expecting to see a steady rise in women’s participation in editorial work after the election of the first women into the Royal Society. Our analysis shows that the admission of women was not, in itself, enough to change the organizational culture of scientific publishing there. This finding challenges the assumption, often made by powerful institutions, that accepting women into a male-dominated group is enough to bring about equality. Overcoming centuries of tradition is difficult, and long overdue. Herschel, C. Phil. Trans. R. Soc. Lond. 77, 1–3 (1787). Shapin, S. A Social History of Truth: Civility and Science in Seventeenth-Century England (Univ. Chicago Press, 1994). Røstvik, C. M. & Fyfe, A. Open Libr. Humanit. http://dx.doi.org/10.16995/olh.265 (2018). Moxham, N. & Fyfe, A. Hist. J. http://dx.doi.org/10.1017/S0018246X17000334 (2017). Mason, J. Notes Rec. R. Soc. Lond. 46, 279–300 (1992). Mason, J. Notes Rec. R. Soc. Lond. 49, 125–140 (1995). Fox, M. F. Soc. Stud. Sci. 35, 131–150 (2005). Helmer, M., Schottdorf, M., Neef, A. & Battaglia, D. eLife 6, e21718 (2017). Baldwin, M. Notes Rec. R. Soc. Lond. 63, 81–94 (2009). Glick, P. & Fiske, S. T. Am. Psychol. 56, 109–118 (2001).